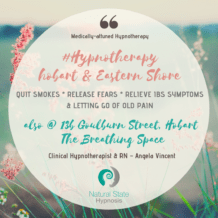 As a Clinical Hypnotherapist & RN, I have a keen interest in the body’s mechanics, particularly the Gut-Brain connection and its links to stress and anxiety. Childhood distress can be alleviated with practical mindfulness skills and empowering hypnotherapy techniques for true self worth to occur. Approach Description: My unique focus provides a Medically-Attuned approach to treating clients with physical, mental and spiritual conditions impacting on their health and wellbeing. I appreciate the need for a sense of safety and the impact of social networks on the wellbeing of our community members. Affordable/Sliding Scale Therapy Details: We all know that life is complex. Contact me directly if you need to discuss any financial hardship that requires special consideration. Clinical Hypnotherapy can be as effective online as it is in person. I offer online programs with effective results. Ideal for maintenance hypnotherapy when periods of distress arise such as a new job, a specific issue requires attention and you are familiar with the Hypnotherapy process. 3x consultations. This program is for Clients that are looking for sustained quit smoking by relieving all past and current stressful triggers and building Mindfulness skills for resilience in future times of worry or discomfort. Phobia's and changes to food cravings can also be dissolved in this space and fear of public speaking or exam panic can be re-programmed for success. 5x consultations. This program focuses on change in several specific areas. The success of Sheila Granger's 'Virtual Gastric Band' program is maintained by ongoing layering of changes to improved eating habits, an increased motivation in exercising, self worth and the building of sustained inner resilience and self belief. This program supports those that are experiencing a change in their lives or are moving towards their own dying process. Hypnotherapy and Mindfulness techniques offer the spirit the gift of a peaceful and loving sense of self compassion during these times. This program is ideal for those suffering with Gut-related pain and tension related to Irritable Bowel Syndrome (IBS) and other Gut related symptoms made worse by anxiety and pressure. The resolution of anxiety and panic triggers and relief from depression in many stages of anxiety-induced depression are made possible in this program. Self or family addiction support and compassion, current or past toxic workplace environmental experiences, bullying in home, school or family and relationship trauma or childhood trauma. 10x consultations offered with 3x weekly consultations followed by 7x bi-weekly consultations creating the changes you desire in your Mind, Body and Spirit. This program allows for continuing change to occur in a way that can be intergrated into your life whichever phase of life you are currently experincing such as acute, chronic or palliative health and wellbeing, the Carer of a significant other going through these changes. Perhaps you are ready to tackle a complex change such as achieving true self love such as your challenges relating to your true sexual orientation, a significant work or relationship change or a major move? This space is a wonderful place to create your place of understanding and self compassion and empathy to relieve the shame of abortion and acknowledge babies of miscarriage and stillborn or what we know as Angel-babies. Hypnotherapy can be provided as an online service and encouraged. * Every person is different despite the positive experiences witnessed, results may vary from person to person. For entry to my Rosny consulting room please enter from behind Westpac Bank in the Rosny Bus Mall. You'll spot us on the Mezzanine level, Suite 9.